Nielsen’s latest Global Survey of Consumer Confidence and Spending Intentions found that India is the second most optimistic country in the world with a confidence index of 120 points. In the first quarter of 2013, India, Brazil and China are among the top seven most confident nations globally. “The last year has seen shifting sentiment on confidence, where consumers are feeling good about themselves, but not the environment around them,” Nielsen India President Piyush Mathur said in a statement. Indonesia is at the top spot closely followed by India at 120 points which recorded a decrease of one point from the fourth quarter of last year. 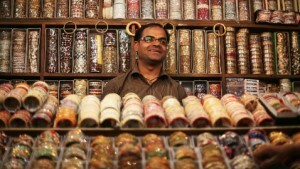 “Indian consumers are indicating a higher discretionary spending for the year,” Mr Mathur added. Sixty per cent of respondents in India indicated they would put spare cash into savings, up six per cent from the previous quarter. Forty-two per cent said they would invest in new technology and products, up from 39 per cent from the last quarter, while 41 per cent reported they would spend spare cash on new clothes, a five point increase, it added. “Pockets of local government austerity measures, combined with improved prospects for Asia imports by the US economy, created opportunity for healthy confidence gains in Southeast Asia markets and substantial gains in Hong Kong, Japan, South Korea and Taiwan,” said Therese Glennon, Nielsen’s APMEA region consumer insights leader. “The Asia Pacific consumer continues to gain optimism, yet remains quite discerning and frugal, and will continue to prioritise saving and investment,” added Glennon. The Nielsen Global Survey of Consumer Confidence and Spending Intentions was conducted between February 17 and March 8, 2013, and polled more than 29,000 online consumers in 58 countries throughout Asia-Pacific, Europe, Latin America, the Middle East, Africa, and North America.